Let’s take a trip to the past and chat about 1984 so I can catch up on my past reviews before the thought police get me, although I promise that I have officially started reading our current tome To the Lighthouse! For Andi’s 1984 review, click here. 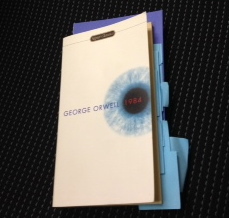 1984 was written in 1949 and established a dark future for the citizens of that time, including the main characters Winston and Julia, who try to resist the penultimate control of the government (Big Brother). My Signet Classics version ($7 at Target- go buy it!) calls it “completely convincing” and I whole-heartedly agree! Even if someone wanted to recall something from their childhood – something simple such as the name of a European country in “Oldspeak,” the term for words prior to the Party’s control, it would be a crime to even think about it, so a citizen wouldn’t be able to talk with anyone or share that memory. “Everything melted into a mist,” and really all conversations would be forced into the present. And what if one did remember something specifically? In addition to destroying the past, the Party controls the present through the flow of information as well. Winton’s job is in the Records Department, and one of his jobs is to rewrite the present. That task is not given to one person. If the new “Oceania” won a victory over “Eurasia,” that information would be given to 3 or 4 writers, all of whom would write an article based on the information they were given. Then the Party would take parts of each and craft the information they wanted to portray. The writers wouldn’t see the finished product. Any past information to the contrary of what happened, someone’s prediction that the other side would win, for instance, would be destroyed. Even more frightening than this level on control is the fact that Winston was a child when the party was created and started systematically destroying history and altering the present. All it would take is one more generation for there to be absolutely no knowledge that was not Party-generated. One generation. All works of fiction – Shakespeare, Milton, Chaucer – were also being updated into “Newspeak” and the originals destroyed. By destroying and altering language, the Party destroys and alters thought – by 2050, this colleague predicted, no one would be able to consider “freedom” because that word would not exist, and therefore the concept would not exist. This whole premise of achieving complete control by altering language and information was fascinating to me. I could write pages and pages on this, and I’m sure there are thesis papers, books, and articles already written about it. These concepts comprise the first half of the book and it was gripping. I held on for the second half of the book as well, because the Winston and Julia plot thickens and their resistance to the government increases. Spoiler Alert – The part I remembered from high school was Winston breaking down during the torture with the rats and screaming, “Do it to Julia!” so I kept feverishly reading and turning the pages until I got to that part. I think that scene stayed with me for the last 30 years not only because of the vivid imagery and terrifying psychological torture portrayed, but because in class we focused on that section as a turning point in the novel. So kudos to all teachers, who are creating lessons that could stay with their students for a lifetime. I won’t detail what happens after that point because you should definitely read this book! And remember, “The consequences of every act are included in the act itself. ” I had to include one more quote! However, I could also have used, “The end was contained in the beginning.” Ok, Ok, I’ll stop. The picture that goes with this post is my copy, full of sticky notes from thoughts and bits of language that stuck with me, so you can feel lucky that this post was only 893 words long! Well done, my friend. I love that you went with the language portion of the book. How fitting! I think this is the first post we really did divide on EM and ME. English and Engineering! Off to read about the lighthouse.